Photos: Roberto Ruiz / Barcelona Gallery Weekend. The second edition of Composiciones (see 2015 edition) presented five artistic interventions by Lúa Coderch (at the Club Billar Barcelona); Regina Giménez (at the former textile factory Can Trinxet, L’Hospitalet de Llobregat); Lola Lasurt (at the Biblioteca Pública Arús); Robert Llimós (connecting all the participating galleries) and Wilfredo Prieto (at the Mounted Unit of the Barcelona City Police) in unique sites across the neighbourhoods of the city. Each of the commissioned artists is represented by a gallery participating in the Barcelona Gallery Weekend. Their projects offered moments of intermission, intimacy and bewilderment throughout the weekend, highlighting some lesser-known aspects of the city’s cultural heritage and municipal history. Conceived and curated by Latitudes for the second time, the project further explores Barcelona as a rich fabric of the historic and the contemporary, the unfamiliar and the conspicuous. Resisting an overall theme, and instead developing from the artists’ responses to the specificity of each context—people as well as places—the five art projects formed a temporary thread linking evocative locations and public space, running parallel to the Weekend’s exhibitions in galleries and museums. Lúa Coderch’s intervention for the Composiciones programme brings a mysterious and improbable apparition to life in the home of the Club de Billar Barcelona. Beneath the Teatre Coliseum in Gran Vía there is a rainbow. 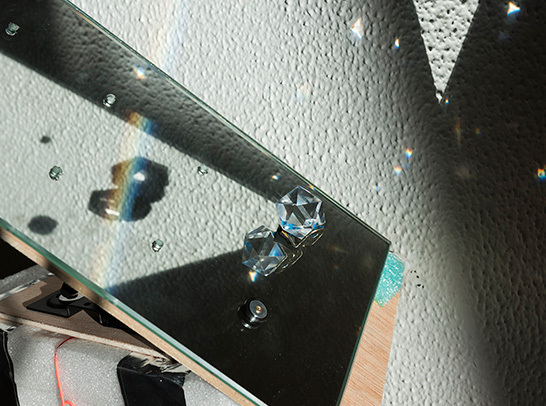 Coderch guides sunlight and a spectrum of colours down into the underground gaming space with a series of precisely positioned mirrors and prisms, as if evoking the mechanics, geometry and artistry involved in billiards. 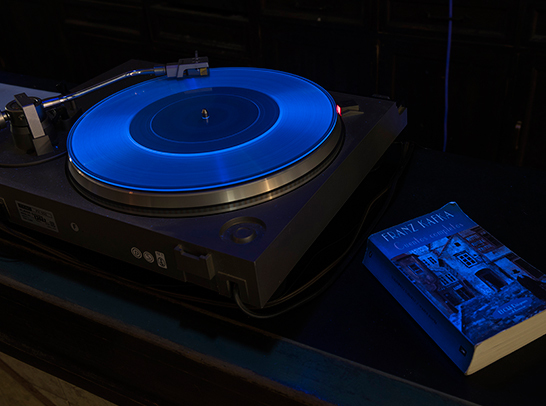 Accompanying the rainbow is a turntable and a transparent vinyl record that can be used to play an audio recording of a female voice. This voice narrates and interprets what can be seen in front of us, and the process that led to its appearance. The title of her intervention, “The Rainbow Statement” (2016), refers to one of the verbal tricks used by fortune-tellers and clairvoyants in ‘cold reading’ an individual’s life or personality. Suggestively nebulous assertions maximize the chance of apparently specific and meaningful paranormal insights hitting the mark. “The Rainbow Statement” is either an experiment of the imagination or a phenomenon of optical science with which Coderch seems to have invented a form of psychic meteorology, or spectral physics. Sunday 2 October, 12am: Guided visit by Lúa Coderch and Latitudes at the Club Billar Barcelona, Gran Via de les Corts Catalanes, 595-599. With the collaboration of David Merino and Eladi Sánchez. With thanks to: Miquel Casademunt, Jordi Figueras, Santiago Royo, Santiago Vallmitjana and Roberto Macovez. Lúa Coderch (Iquitos, Perú, 1982) obtained an MA in Artistic Production and Research (2012) and a degree in Fine Arts at the Universidad de Barcelona (2010). Amongst her individual exhibitions are: ‘Night in a Remote Cabin Lit By a Kerosene Lamp’, Galería Àngels Barcelona (2015); ‘Or’, Fundació Suñol, Barcelona (2014–2015); ‘La parte que falta’, Galería Bacelos, Madrid (2014); ‘La muntanya màgica’, Espai 13, Fundació Joan Miró, Barcelona (2013–14). She has participated in the following group shows: ‘¿Por qué no lo llamas entropía?’, Edición 0 Encuentro de Cultura Contemporánea de Guadalajara, México (2015); ‘The World of Interiors’, The Green Parrot, Barcelona (2014), ‘El futuro no espera’, La Capella, BCN Producció (2014). Coderch is represented by galería Bacelos (Madrid/Vigo) and àngels barcelona. The Club Billar Barcelona (Barcelona Billiards Club) was founded in 1928 in its current location, the basement of the old Coliseum in Gran Vía – a cinema that was built in 1923 and converted into a theatre in 2006. The Club Billar Barcelona is the governing body of billiards clubs in Spain and currently has around 60 members. The many trophies that fill its vitrines are evidence of the dozens of national and international titles won by members of the club. These include over twenty cups for the championships of La Liga Española a Tres Bandas (Spanish Carom Billiards League) and seven for the European Championships of Carom Billiards for teams. The Club Billar Barcelona has six tables for carom billiards for the enjoyment of its members and four others available for the general public, as well as two pool tables. Since 1990, it organises the annual trophy “Trofeu Ciutat de Barcelona”. The manufacturing and printing of textiles formed the basis of the industrial revolution in Catalunya. Beyond the actual fabric, it is the machinery of its production and the people who operated it—especially women—that underpins Regina Giménez’s presentation of her graphic works as part of the Compositions programme. 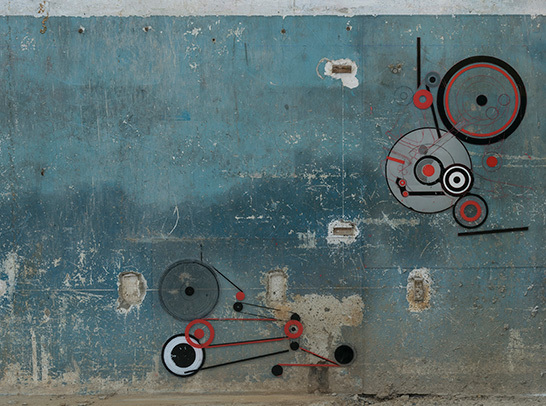 Taking place in one of the buildings that comprises Can Trinxet, a former textile factory complex that once employed the largest workforce in L’Hospitalet de Llobregat, Giménez’s intervention comprises painted compositions that are derived from schematic representations of machines and their components. Her abstractions have been applied on transparent panels that lean against a scarred factory wall, becoming devices that reanimate the marks and memories embedded in the building. An accompanying poster evokes the clamour that once would have filled the workshop in typographic form. Giménez has titled her project “La Constancia” (2016) in tribute to the labor union that called a general strike in 1913 to protest the conditions of the female and child workers who undertook the textile industry’s most monotonous and arduous tasks. 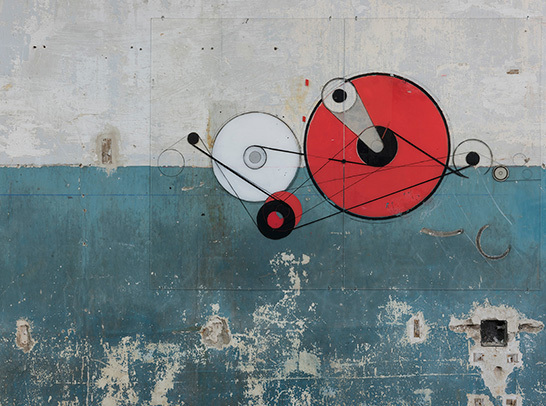 Friday 30 September, 12am: Guided visit by Regina Giménez and Latitudes at the former factory Can Trinxet, c/ Santa Eulàlia 182–212, L’Hospitalet de Llobregat. With thanks to: Ajuntament de Hospitalet de Llobregat, Albert Mercadé, Martí Anson. Regina Giménez (Barcelona, 1966) has exhibited individually at: ‘Architecture d’aujourd’hui’, The Green Parrot, Barcelona (2015); ‘Art de foc art de badoc’, Nadala 2015 Fundació Joan Miró, Barcelona (2015); ‘Simbols Convencionals’, Museu d’Art Modern de Tarragona (2012). She has recently participated in the following group shows: Biennal de Valls, Tarragona (2015); ‘Modernitat Amagada’, Casa Capell, Mataró (2013); ‘La casa de la playa’ para ‘Cas de estudi’, Can Felipa, Barcelona (2013). Giménez is represented by Ana Mas Projects, L’Hospitalet/San Juan (Puerto Rico) and by Galería Miquel Alzueta, Barcelona. Designed in 1905, Can Trinxet was a factory for cotton yarn and fabric that operated until the beginning of the 1980s. For many years it was the factory that provided the most jobs in L’Hospitalet – in 1923 it employed 1,155 workers (45% of the city’s workforce), of which 863 were women. Despite its current deterioration and the profound modifications it has undergone, it is still considered one of the finest examples of industrial architectural heritage in the area, as much for its importance in textile production in L’Hospitalet as for its social value in terms of labour and union history in the district of Santa Eulàlia. Can Trinxet was principally known for producing white sheets, but also made tablecloths and corduroy for dying, including the popular golden-brown corduroy uniforms of the workers of the Companyia de Tramvies (Tram Company of Barcelona). In her intervention, Lola Lasurt has collaborated with the Biblioteca Pública Arús, a study centre founded in 1895 with outstanding collections related to the labour movement, anarchism, Freemasonry and Sherlock Holmes. The project centres on a series of grisaille paintings forming a pictorial frieze that hangs from the balcony above a presentation of books in the Arús’s display cases. Under the title “Donació” (Donation), 2016, Lasurt departs from 135 publications that once formed the personal library of Assumpta Corbera Santanach that were gifted in 2010 to the Arús after her death. Corbera Santanach identified as a feminist and a Freemason; she was not a public figure. Yet the impulse of Lasurt’s project is not primarily biographic or historiographic, but bibliographic and pictorial. Accordingly, “Donació” attempts to narrate changes in social and cultural attitudes through the selection and redrafting of images that appear on the pages of the bibliographic bequest. Treating the publications as an intimate accumulation of ‘alternative’ knowledge and a representation of a self-education, Lasurt is interested in the portrayal of a private political imagination in the midst of what is now a public collection. Thursday 29 September, 6pm: Guided visit by Lola Lasurt and Latitudes at the Biblioteca Pública Arús, Passeig de Sant Joan, 26. With thanks to: Biblioteca Pública Arús [Maribel Giner i Molina (Director); David Domènech i Baró (Librarian); Mª Dolores Fernández Serrano and Josefa Ferrando Ruiz (Front Desk); Gabriela García Neuer (Administration)]; Celorama SL; Círculo Téxtil; Estel.la and Maragda Estany Corbera; Salvador Estany. Lola Lasurt (Barcelona, 1983) studied Fine Arts (2005) at the Universitat de Barcelona and obtained a postgraduate in Aesthetics and Contemporary Art Theory, Universitat Autònoma Barcelona (2007) and an MA in Artistic Production and Research (2009). She has been resident at HISK, Ghent; La Ene, Buenos Aires and at the Greatmore Art Studios, Cape Town. She has exhibited individually at ‘Promenade’, 105 Besme, Brussels (2015); ‘Exercici de ritme’, Galeria Joan Prats, Barcelona (2015); ‘Doble autorización‘, as part of the exhibition cycle ‘Arqueología preventiva’, Espai 13, Fundació Joan Miró, Barcelona (2014); ‘Amnèsies’, Espai2, Terrassa (2012), ‘El Gegant Menhir’, Museu Joan Abelló, Mollet del Vallès (2011). Amongst her group shows are ‘Young Belgian Art Prize 2015’, Bozar, Brussels (2015); ‘Write of Spring’, Het Paviljoen, Ghent (2014); ‘Narrativas domésticas: más allá del álbum familiar’, Visiona, Huesca (2013); ‘Los inmutables’, DAFO, Lleida (2012); ‘La gran aventura’, Can Felipa, Barcelona (2012); ‘Learn and Teach’, Greatmore Art Studios, South Africa (2012). Lasurt is represented by Galeria Joan Prats, Barcelona. Robert Llimós presents a new version of an action that was originally created in the summer of 1972. One of the very few performative works of an artist primarily known for his paintings and sculptures, “Los Corredores” (The Runners), was first realized as part of the legendary avant-garde art festival known as Los Encuentros de Pamplona (The Pamplona Meetings). 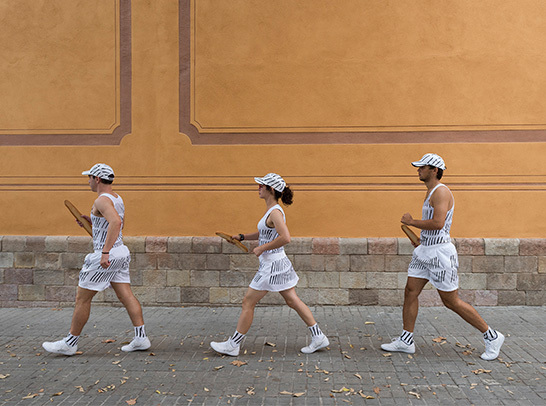 On that occasion, three people dressed in identical running gear speed-walked throughout the city, connecting the various venues of the festival. 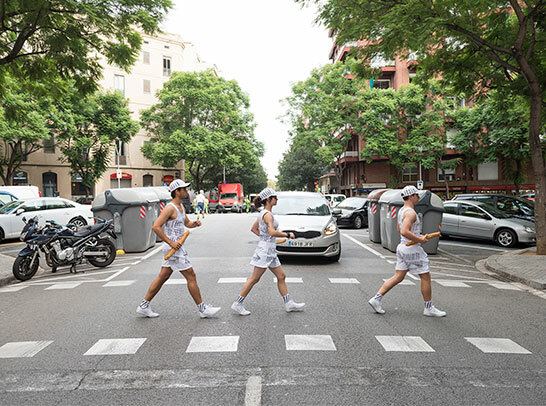 As his project for the Composiciones programme, Llimós’s Los Corredores is now restaged on the streets of Barcelona. Three athletes criss-cross the city, seemingly rushing to see every venue of the Gallery Weekend. As in Pamplona, the white sports kits have been adorned by Llimós with black diagonal brushstrokes that symbolize the idea of painting. At times the speed-walking trio carry flowers, at others carry a baguette, or have their ankles joined with elastic ribbon—a painting-as-workout that has left the studio for the street with decoration, discipline, and a dynamic sense of urgency. Friday 30 September, 5pm: Guided visit by Robert Llimós and Latitudes. Meeting point: BlueProject Foundation, c/Princesa 57. With thanks to: Bruna Costa; Taller Vallirana and the runners Marta Bassart, Jaume Arija, Anna Sevilla and Diego del Castillo. Robert Llimós’s (Barcelona, 1943) long trajectory as a painter and sculptor began in the sixties within the Nueva Figuración (New Figuration) movement (1965-1968). Between 1969-1973 he went through a more conceptual phase returning to figurative painting with a greater emphasis on colour. His work has been exhibited individually at the Museum Bochum, Germany (1994), Galería Alejandro Sales, Barcelona (2009); Fundació Vila Casas, Barcelona (2010). in 1972 he was part of the landmark international avant-garde art festival Encuentros de Pamplona (The Pamplona Encounters), as well as participating in the unofficial programme of Documenta 5, Kassel. He has exhibited in institutions such as the Museo del Barrio, Nueva York (1976 and 1978); Fundació Miró, Barcelona (1979, 1983 and 1992); Museu d’Art Contemporani de Barcelona (1996, 1997 and 2005); Museo Reina Sofía, Madrid (2004 and 2009) and the Fundació Suñol, Barcelona (2010), amongst others. Since 2009 Llimós has been producing work depicting extraterrestrial life forms and flying objects. In 1994 the Generalitat de Catalunya awarded him the Fine Arts Award. Two of his public sculptures can be seen in Barcelona: “Marc” (1997) in the Olimpic area and “Mirastels” (2006) a floating sculpture in the Port of Barcelona. Llimós is represented by Galería Alejandro Sales, Barcelona. 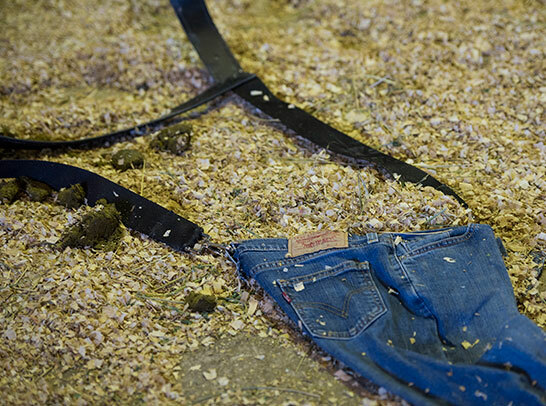 Conceived by Wilfredo Prieto as his project for the Composiciones programme, “Pantalones rotos” (Torn Jeans), 2012, is realised by the horses of the Guàrdia Urbana de Barcelona. The action-sculpture takes place at the Mounted Unit’s stables, a historic venue next to the city zoo that is not normally open to the public and whose exercise paddock is overlooked by the twin towers of the Torre Mapfre and Hotel Arts. In his work Prieto makes reference to an image which appears on the tag of every pair of classic Levi’s denim jeans—two horses trying in vain to break a pair of the reinforced trousers. Since their invention in 1873, Levi Strauss & Co.’s famous copper-riveted denim has become synonymous with the working people of the western United States—cowboys, lumberjacks, and railroad workers. Yet in “Pantalones rotos”, this symbol of the American frontier myth has been already torn apart with bathos as two harnessed horses each drag one half of a torn pair of jeans. With thanks to: Lena Solà Nogués; the Mounted Unit of the Barcelona City Police [Salvador Pallarès (General Director); Agustín Méndez (Sergeant); Gemma Mina (Saddler and harness maker); Adolfo Martínez (Horseman); and the horses Solero, Tulio (grey), Hércules and Aguileño (chesnut)]. Wilfredo Prieto (Sancti Spiritus, Cuba, 1978) pursued art studies at the Instituto Superior de Arte (Higher Institute of Fine Arts ISA), graduating in 2002. Prieto’s recent solo exhibitions include: ‘Ping Pong Grid’, Museo Nacional de Bellas Artes, Havana, Cuba (2015); ‘Speaking Badly about Stones’, S.M.A.K, Ghent, Belgium (2014); ‘Incidences from the Private to the Public and from the Public to the Private’, NMAC Foundation, Cádiz, Spain (2013); ‘Leaving Something to Chance’, Sala de Arte Público Siqueiros, México (2012); ‘Balancing the curve’, Hangar Bicocca, Milan, Italy (2012); ‘Amarrado a la pata de la mesa’, Centro de Arte 2 de Mayo (CA2M), Móstoles, Madrid (2011); and has participated in group shows such as ‘Under the same sun: Art from Latin America Today’, Guggenheim Museum, Nueva York (2014); ‘Coup d’éclat, En résonance’, Biennale d'art contemporain de Lyon, Francia (2009); ‘Untitled’, 12th Istanbul Biennial, Turquía (2009). Prieto has been awarded the Cartier Award (Frieze Art Fair, London, 2008) and the UNESCO Prize for the Promotion of the Arts (2000). Prieto’s work is represented by NoguerasBlanchard, Barcelona/Madrid; Annet Gelink Gallery, Amsterdam and kurimanzutto, Mexico City. The Mounted Unit of the Barcelona City Police performed for the first time in November 1856. Currently the Unit carries out both policing and ceremonial work. It provides guard duties and protection for citizens, as well as crowd management and escorting during popular festivities such as the Procession of the Three Kings. For the latter type of ceremonial acts, the riders wear a formal uniform of red jackets and silver helmets with crests of white feathers. At times the riders carry a musical instrument to perform as the Band of the Barcelona City Police. 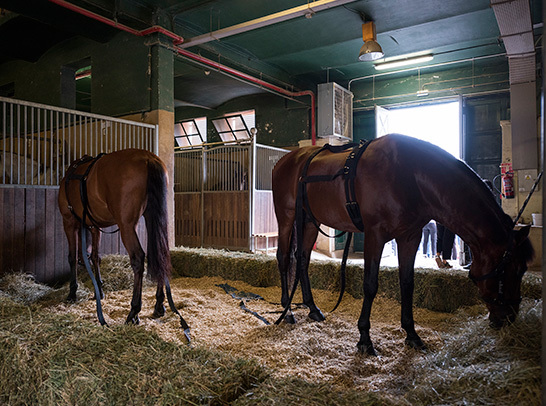 The Unit’s policemen care for and train the 38 horses under their charge in the Stables of the Ciutadella Park, a building originally constructed to house the Gallery of Machines during the 1888 Universal Exhibition. Throughout the year the Mounted Unit performs different carousels for events such as the festivities of La Mercè, the patron saint of Barcelona, or the Open Day celebrating the patron saint of the City Police, in addition to other appearances on a national and international level. Performed since 1910, the carousel is an equine exercise in which riders parade on horseback and form shapes to the rhythm of music. In 2016 the Mounted Unit celebrates its 160th anniversary. Anna Casaña, Mireia Pons, Silvia Lorenz, Meritxell Ferré, Hana Boukalam, Júlia Escudero, Carla Blanco, Martina Mefano, Mariona Bonet, Marta Sellarés, Mireia Oltra, Sofía Giménez. Special thanks to Glòria Pou, Lídia González Alija and Andrea Martínez at the Barcelona Gallery Weekend office and to its Executive Committee. Our heartfelt thanks to Gina, Lola, Lúa, Robert and Wilfredo. Ajuntament de Barcelona (ICUB), the Generalitat de Catalunya (ICEC), the Ajuntament de L’Hospitalet de Llobregat and AC/E Acción Cultural Española, as well as private sponsors and individual patrons. Cortesía: Roberto Ruiz / Barcelona Gallery Weekend. En su segunda edición Composiciones produjo intervenciones de los artistas Lúa Coderch (en el Club Billar Barcelona); Regina Giménez (en la antigua fábrica textil Can Trinxet, L’Hospitalet de Llobregat); Lola Lasurt (en la Biblioteca Pública Arús); Robert Llimós (conectando las galerías participantes) y Wilfredo Prieto (en la Unidad Montada de la Guardia Urbana de Barcelona), emplazamientos singulares dispersos la ciudad condal. Cada artista está representado por una de las galerías participantes en el Barcelona Gallery Weekend. El programa ofreció momentos de pausa, de intimidad y de asombro a lo largo del fin de semana, destacando algunos aspectos menos conocidos de la herencia cultural de la ciudad y de su historia municipal. Comisariado por segundo año por Latitudes (edición 2015), el ciclo explora Barcelona como trama afluente de lo histórico y lo contemporáneo, de lo desconocido y lo evidente. Resistiéndose a un tema generalizante, los cinco proyectos artísticos se desarrollan a partir de la respuesta de cada artista a un determinado contexto –a su comunidad o a su emplazamiento– para formar un hilo temporal donde se aúnan ubicaciones evocadoras y espacios públicos para discurrir paralelamente a las exposiciones en galerías y museos del Gallery Weekend. La aportación de Lúa Coderch para el proyecto del programa Composiciones es una aparición viviente, tan misteriosa como improbable, en la sede del Club Billar Barcelona: bajo el Teatre Coliseum de la Gran Vía, surge un arco iris. Mediante una serie de espejos y prismas estratégicamente situados, Coderch dirige la luz solar y un espectro de colores hacia la sala de juegos subterránea con la intención de evocar la mecánica, la geometría y la habilidad característica del juego de billares. Acompañando al arco iris hay un tocadiscos y un disco de vinilo transparente que reproduce la grabación de una voz femenina. La voz narra e interpreta lo que vemos frente a nosotros, así como el proceso que condujo a su aparición. El título de su intervención, “The Rainbow Statement” (2016), se refiere a uno de los trucos verbales utilizados por los adivinos y clarividentes cuando efectúan una “lectura en frío” de la personalidad o biografía de un sujeto. Toda aserción sugestivamente velada optimiza la probabilidad de incrementar la verosimilitud de algo esencialmente paranormal. The Rainbow Statement puede ser un experimento de la imaginación o un fenómeno científico óptico con el que Coderch parece haber inventado una modalidad de meteorología psíquica o de física espectral. Domingo 2 de octubre, 12am: Visita comentada por Lúa Coderch y Latitudes en el Club Billar Barcelona, Gran Via de les Corts Catalanes, 595-599. Con la colaboración de David Merino y Eladi Sánchez. Agradecimientos: Miquel Casademunt, Jordi Figueras, Santiago Royo, Santiago Vallmitjana y Roberto Macovez. Lúa Coderch (Iquitos, Perú, 1982) es licenciada en Bellas Artes por la Universidad de Barcelona (2010) y obtuvo un Máster en Producciones Artísticas e Investigación (2012). Entre sus exposiciones individuales destacan: ‘Night in a Remote Cabin Lit By a Kerosene Lamp’, Galería Àngels Barcelona (2015); ‘Or’, Fundació Suñol, Barcelona (2014–2015); ‘La parte que falta’, Galería Bacelos, Madrid (2014); ‘La muntanya màgica’, Espai 13, Fundació Joan Miró, Barcelona (2013–14). Y entre sus colectivas se encuentran: ‘¿Por qué no lo llamas entropía?’, Edición 0 Encuentro de Cultura Contemporánea de Guadalajara, México (2015); ‘The World of Interiors’, The Green Parrot, Barcelona (2014), ‘El futuro no espera’, La Capella, BCN Producció (2014). Su obra está representada por la galería Bacelos (Madrid/Vigo) y Àngels Barcelona. 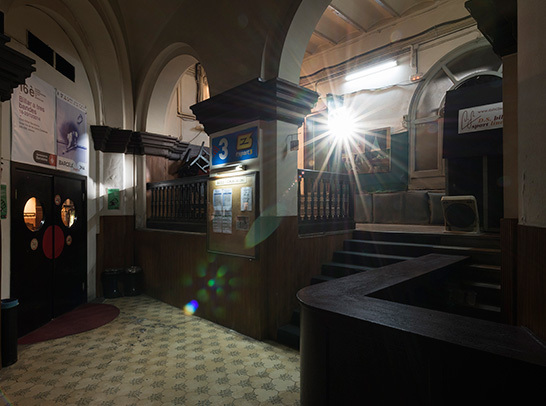 El Club Billar Barcelona se fundó en 1928 en su actual ubicación, el subterráneo del antiguo cine Coliseum en la Gran Vía – edificio de 1923 reconvertido en teatro en el 2006. El Club Billar Barcelona es el club de billar decano de España y actualmente cuenta con unos 60 socios. Gran cantidad de trofeos ornamentan sus vitrinas, dando testimonio de los muchos títulos nacionales e internacionales obtenidos, entre ellos más de veinte como campeones de la Liga Española a Tres Bandas y en siete ocasiones del Campeonato de Europa de Tres Bandas por equipos, logrando dos copas en propiedad. El Club Billar Barcelona dispone de seis mesas de billar francés (carambola) para el disfrute de sus socios y cuatro disponibles para el público, así como de dos mesas de billar americano (pool). Desde 1990 organiza el campeonato anual “Trofeu Ciutat de Barcelona”. La revolución industrial en Cataluña tuvo sus fundamentos a partir de la manufactura textil y del estampado. Más allá del tejido propiamente, los mecanismos de producción y la mano de obra -femenina en su mayor parte- es aquello que concierne la presentación de la obra gráfica de Regina Giménez y que forma parte del programa Composiciones. Ubicada en uno de los edificios de Can Trinxet, antiguo complejo textil que en su día empleó la mayor mano de obra de L’Hospitalet de Llobregat, la intervención de Giménez abarca desde composiciones pintadas derivadas de representaciones esquemáticas de los telares hasta sus componentes. Sus abstracciones se han aplicado a unos paneles transparentes apoyados sobre los muros ajados de la fábrica convirtiéndose en instrumentos que reavivan las secuelas y los recuerdos que impregnan el edificio. Se acompañan de un cartel que, tipográficamente, evoca el estruendo que en una época había existido en ese espacio. La autora ha titulado el proyecto “La Constancia” (2016), a modo de tributo al sindicato obrero que en 1913 convocó una huelga general en señal de protesta por las condiciones bajo las cuales trabajaban mujeres y niños que llevaban a cabo las tareas más arduas y monótonas de aquella industria. Viernes 30 de septiembre, 12am: Visita comentada por Regina Giménez y Latitudes en la antigua fábrica Can Trinxet, c/ Santa Eulàlia 182–212, L’Hospitalet de Llobregat. Agradecimientos: Ajuntament de Hospitalet de Llobregat, Albert Mercadé, Martí Anson. Regina Giménez (Barcelona, 1966) entre sus exposiciones individuales se incluyen: ‘Architecture d’aujourd’hui’, The Green Parrot, Barcelona (2015); ‘Art de foc art de badoc’, Nadala 2015 Fundació Joan Miró, Barcelona (2015); ‘Simbols Convencionals’, Museu d’Art Modern de Tarragona (2012). Entre sus colectivas destacan: Biennal de Valls, Tarragona (2015); ‘Modernitat Amagada’, Casa Capell, Mataró (2013); ‘La casa de la playa’ para ‘Cas de estudi’, Can Felipa, Barcelona (2013). La obra de Giménez está representada por Ana Mas Projects, L’Hospitalet/San Juan (Puerto Rico) y por Galería Miquel Alzueta, Barcelona. Can Trinxet fue una fábrica de hilados y tejidos de algodón proyectada en 1905 cuya actividad se prolongó hasta principios de los años 80. Durante muchos años fue la fábrica que más trabajo dio en L’Hospitalet – en 1923 contaba con 1.155 trabajadores (el 45% de los obreros censados en la ciudad), de los cuales 863 eran mujeres. A pesar de su actual deterioro y las profundas modificaciones sufridas, se considera como uno de los mejores ejemplos del patrimonio arquitectónico industrial de la zona tanto por la importancia productiva que tuvo dentro del sector textil de L’Hospitalet como por su valor social como referente laboral y sindical del barrio de Santa Eulàlia. Can Trinxet fue famosa fundamentalmente por producir sábanas blancas, pero también produjo manteles y piezas de pana para tintar – la popular pana de color tostado con la que se confeccionaban los uniformes de los trabajadores de la Companyia de Tramvies de Barcelona. En su intervención para el programa Composiciones, Lola Lasurt ha colaborado con la Biblioteca Pública Arús, centro de estudios fundado en 1895 y que alberga una destacada colección dedicada al movimiento obrero, al anarquismo, a la masonería y a Sherlock Holmes. El proyecto de Lasurt consta de una serie de pinturas en grisalla que conforman un friso colgando desde el balcón sobre una presentación de libros de la colección Arús. Bajo el título Donació (2016), Lasurt toma como punto de partida 135 publicaciones que en su día pertenecieron a la colección personal de Assumpta Corbera Santanach, donadas en 2010 a la biblioteca después de su fallecimiento. Corbera Santanach, identificada como feminista y perteneciente a la masonería no era una figura pública notoria, el impulso que le otorga el proyecto de Lasurt no pretende ser biográfico ni historiográfico sino, ante todo, bibliográfico y pictórico. Por esta razón, “Donació” pretende narrar los cambios acaecidos en las actitudes sociales y culturales mediante una selección y un nuevo esbozo de las imágenes presentes en las páginas de aquel legado. El interés de Lasurt radica en representar una imaginación política privada en medio de lo que actualmente es una colección pública, al tratar esas publicaciones como una acumulación íntima de conocimiento “alternativo” y una representación de la formación autodidacta. Jueves 29 de septiembre, 18h: Visita comentada por Lola Lasurt y Latitudes en la Biblioteca Pública Arús, Passeig de Sant Joan, 26. Agradecimientos: Biblioteca Pública Arús [Maribel Giner i Molina (Directora); David Domènech i Baró (Bibliotecario); Mª Dolores Fernández Serrano and Josefa Ferrando Ruiz (Atención al público); Gabriela García Neuer (Administración)]; Celorama SL; Círculo Téxtil; Estel.la y Maragda Estany Corbera; Salvador Estany. Lola Lasurt (Barcelona, 1983) estudió Bellas Artes (2005) en la Universitat de Barcelona y cursó un posgraduado en Estética y Teoría de Arte Contemporáneo en la Universitat Autònoma Barcelona (2007). En el 2009 obtuvo un Máster en Producción Artística e Investigación y en el 2015 cursó el programa post-académico HISK, en Gante, Bélgica (2014). Lasurt ha expuesto individualmente en: ‘Promenade’, 105 Besme (2015); ‘Exercici de ritme’, Galeria Joan Prats, Barcelona (2015); ‘Doble autorización’ en el ciclo ‘Arqueología preventiva’, Espai 13 de la Fundació Joan Miró, Barcelona (2014); ‘Amnèsies’, Espai2, Terrassa (2012), ‘El Gegant Menhir’, Museu Joan Abelló, Mollet del Vallès (2011) y entre sus exposiciones colectivas ‘Young Belgian Art Prize’15’, Bozar, Bruselas (2015); ‘Write of Spring’, Het Paviljoen, Gante (2014); ‘Los inmutables’, DAFO, Lleida (2012); ‘La gran aventura’, Can Felipa, Barcelona (2012) y ‘Learn and Teach’, Greatmore Art Studios, Sudáfrica (2012). La obra de Lasurt está representada por Galeria Joan Prats, Barcelona. Robert Llimós presenta una nueva versión de una acción originalmente creada en verano de 1972. Se trata de una de las pocas performances de un artista conocido principalmente por su práctica pictórica y escultórica. “Los Corredores” formó parte inicialmente del legendario festival vanguardista conocido como Los Encuentros de Pamplona y, en aquella ocasión, tres personas vestidas de forma idéntica con atuendo de corredor, cruzaban la ciudad a paso rápido conectando todos los puntos de actividad del festival. 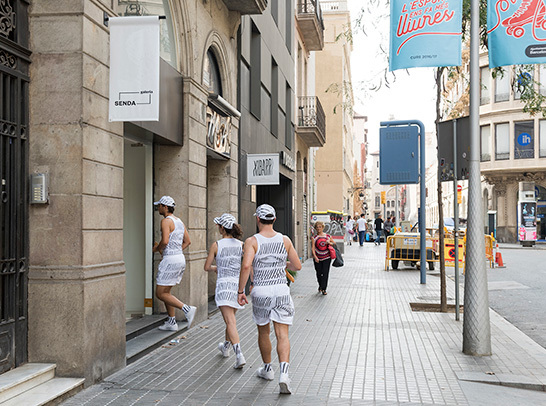 Lo mismo ocurrirá en esta ocasión para el programa Composiciones de Barcelona donde tres atletas con aspecto apresurado, cruzarán la ciudad para recalar en cada espacio participante en el Gallery Weekend. Como en Pamplona, Llimós ha customizado los kits deportivos con franjas negras en diagonal para simbolizar la noción de pintura. En algunas ocasiones el trío de corredores llevará flores y, en otras, se moverá con los tobillos unidos por una cinta elástica para sugerir la pintura como ejercicio físico, un intento por salir del estudio para cumplir con un sentido decorativo, disciplinario y un ineludible impulso dinámico. Viernes 30 de septiembre, 17h: Visita comentada por Robert Llimós y Latitudes. Punto de encuentro: BlueProject Foundation, c/Princesa 57. Agradecimientos: Bruna Costa; Taller Vallirana y los corredores Marta Bassart, Jaume Arija, Anna Sevilla y Diego del Castillo. Robert Llimós (Barcelona, 1943) ha tenido una dilatada carrera como pintor y escultor que se inicia a finales de los sesenta dentro de la Nueva Figuración (1965-1968). Entre 1969-1973 pasó por una etapa de experimentación conceptual retornando a la pintura figurativa otorgando gran énfasis al color. Su obra ha sido objeto de exposiciones individuales en el Museum Bochum, Alemania (1994), Galería Alejandro Sales, Barcelona (2009); Fundació Vila Casas, Barcelona (2010). Entre sus colectivas destaca su participación extraoficial en Documenta 5 de Kassel y, también el mismo año, en los Encuentros de Pamplona. Ha participado en exposiciones colectivas en instituciones como el Museo del Barrio, Nueva York (1976 y 1978); la Fundació Miró, Barcelona (1979, 1983 y 1992); el Museu d’Art Contemporani de Barcelona (1996, 1997, 2005); el Museo Reina Sofía, Madrid (2004, 2009) y la Fundació Suñol, Barcelona (2010), entre muchos otras. Desde el 2009 Llimós se ha dedicado a la producción de obra relacionada con la vida extraterrestre y objetos voladores. En 1994 la Generalitat de Catalunya le otorgó el Premio de Artes Plásticas. En Barcelona se pueden ver algunas de sus esculturas públicas, entre ellas: ‘Marc’ (1997) en la Vil·la Olímpica y ‘Mirastels’ (2006) una escultura flotante en el puerto de Barcelona. Wilfredo Prieto ha concebido su proyecto “Pantalones rotos” (2012) para el programa Composiciones, ejecutado por los caballos de la Guàrdia Urbana de Barcelona. La acción-escultura se ejecuta en las caballerizas de la Unidad Montada del cuerpo, un local histórico junto al parque zoológico, raramente abierto al público y con vistas a la Torre Mapfre y el Hotel Arts. La obra de Prieto hace referencia a una imagen que aparece en la etiqueta de todos los tejanos clásicos de Levi’s: dos caballos intentan en vano desgarrar un par de pantalones muy resistentes. Desde que en 1873 Levi Strauss & Co. inventara su famoso modelo ribeteado en cobre, dichos pantalones se convirtieron en un sinónimo de ropa duradera para trabajar en el oeste de los Estados Unidos utilizada por vaqueros, leñadores y ferroviarios. No obstante, “Pantalones Rotos” cuestiona el mítico símbolo del salvaje oeste norteamericano y cae por los suelos, al mostrar dos caballos enjaezados arrastrando cada uno la mitad de la popular prenda. Agradecimientos: Lena Solà Nogués;en la Unidad Montada de la Guardia Urbana de Barcelona [Salvador Pallarès (Intendente Jefe); Agustín Méndez (Sargento); Gemma Mina (Guardicionería); Adolfo Martínez (Jinete); y a los caballos Solero, Tulio (tordos), Hércules y Aguileño (castaños)]. Wilfredo Prieto (Sancti Spiritus, Cuba, 1978) cursó estudios en el Instituto Superior de Arte (ISA) graduándose en el 2002. Entre sus exposiciones recientes se incluyen: 'Ping Pong Grid’, Museo Nacional de Bellas Artes, Havana, Cuba, (2015); ‘Speaking Badly about Stones’, S.M.A.K, Gante, Bélgica (2014); ‘Leaving Something to Chance’, Sala de Arte Público Siqueiros, México (2012); ‘Balancing the curve’, Hangar Bicocca, Milán, Italia (2012); ‘Landscape with the fall of Icarus. Kunsthalle Lissabon', Lisboa, Portugal (2011); y ha participado en colectivas como ‘Under the same sun: Art from Latin America Today’, Guggenheim Museum, Nueva York (2014); ‘Balancing the curve’, Hangar Biccoca, Milano, Italia (2012); ‘Landscape with the fall of Icarus’, Kunsthalle Lissabon, Lisboa, Portugal (2011); ‘Coup d’éclat, En résonance’, Biennale d'art contemporain de Lyon, Francia (2009); ‘Untitled’, 12th Istanbul Biennial, Turquía (2009). Prieto ha sido galardonado con el Cartier Award (Frieze, Londres, 2008) y con el UNESCO Prize for the Promotion of the Arts (2000). La obra de Prieto está representada por NoguerasBlanchard, Barcelona/Madrid; Annet Gelink Gallery, Amsterdam y kurimanzutto, México DF. La Unidad Montada de la Guardia Urbana de Barcelona desfiló por primera vez en noviembre de 1856. Hoy en día la Unidad realiza trabajos operativos de índole policial y protocolaria. Por una parte ofrecen vigilancia y protección ciudadana, y por otra patrullan como escoltas abriendo paso en grandes concentraciones humanas o en fiestas populares como la Cabalgata de los Reyes Magos. En este tipo de actos protocolarios, los jinetes van engalanados con el uniforme de gala, con casaca roja y casco plateado con penacho de plumas blancas. En ocasiones los jinetes portan un instrumento musical al ser la Banda de Música de la Guardia Urbana de Barcelona. Desde las Caballerizas en el Parc de la Ciutadella, un edificio construido para albergar la Galería de las Máquinas durante la Exposición Universal de 1888, los agentes cuidan, doman y entrenan a los 38 caballos que tienen a cargo. Durante el año, la Unidad Montada realiza diferentes carruseles con motivo de las fiestas y/o eventos importantes de la ciudad como son las Fiestas de La Mercè Patrona de Barcelona, Jornadas de Puertas Abiertas con motivo del Patrón de la Guardia Urbana, así como otras representaciones solicitadas tanto a nivel nacional como internacional. Los carruseles son ejercicios hípicos en la que los agentes desfilan formando figuras a caballo al ritmo de música y que vienen realizando desde 1910. En el 2016 la Unidad Montada celebra su 160 aniversario. Glòria Pou, Lídia González Alija y Andrea Martínez en la oficina organizadora del Barcelona Gallery Weekend y a su Comité Ejecutivo. Nuestro sincero agradecimiento a Gina, Lola, Lúa, Robert y Wilfredo. Ajuntament de Barcelona (ICUB), la Generalitat de Catalunya (ICEC), el Ajuntament de L’Hospitalet de Llobregat y AC/E Acción Cultural Española, así como de patrocinadores privados y mecenas particulares.